Bruce Memblatt’s story, “Destruction: A Plague Story” has been accepted for MISERIA’S CHORALE, which will also feature my short story, “Becoming the Beast”. Memblatt is the author of the short story collection, THE DARK JAR, and his work as appeared in such HORROR ZINE anthologies as TWICE THE TERROR, WHAT FEARS BECOME, and SHADOW MASTERS. MISERIA’S CHORALE will also feature stories from the following writing award-winners and finalists: Peter Crowther, Lucy Taylor, Todd Keisling, Anna Taborska, K. Trap Jones, Christopher David Rosales, Christina Murphy, B.T. Joy, and James S. Dorr. Forgotten Tomb Press will release the anthology soon in eBook and paperback formats via Amazon.com, CreateSpace.com, Smashwords.com, and other selected outlets. Click on the image of the article to enlarge. The event featured a selection from LOSING TOUCH, Denise Fleischer reading from her latest novel, DEADLY RESERVATIONS, music from Scott Fischer of Fischer’s Flicker, and an art display featuring sculptures and paintings from Adam Nardi. The next LOSING TOUCH reading event is scheduled for November 15th from 6 p.m. to 9 p.m. at Bad Grammar Theater hosted by Powell’s Bookstore University Village near the Roosevelt shopping corridor and just off the Dan Ryan Expressway. Parking is available for $2 at a nearby garage or in metered spaces on the street. I need me some glasses like this. 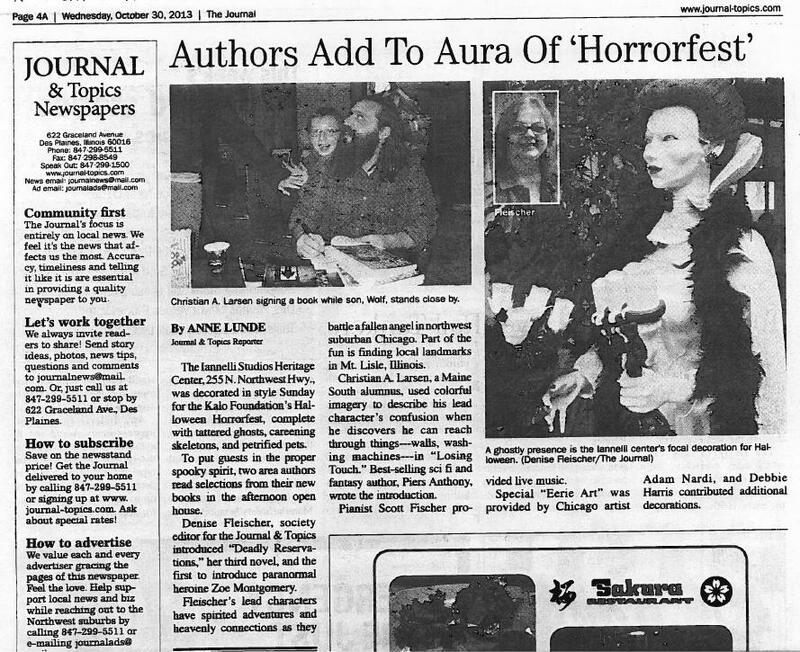 If the Kalo Foundation’s Homegrown Horrorfest at Iannelli Studios Heritage Center in Park Ridge is any kind of a lead-in, this year’s Halloween is going to be epic. A tear the roof off type. Journal & Topics lifestyle editor Denise Fleischer read a selection from her novel, DEADLY RESERVATIONS, Adam Nardi’s sculptures and paintings brought new angles and perspectives to horror, and Scott Fischer of Fischer’s Flicker hit all the right notes during his performances (including a cover of Jethro Tull’s “Locomotive Breath” featuring George Kikos on recorder!). I also read from LOSING TOUCH, met some friends old and new, and enjoyed some hot cider and popcorn. Weather was great, too. It was just a beautiful day to come out to what is a crown jewel of Park Ridge’s cultural heritage. Yep, I went to college. Lindsey can confirm this documented fact. Coming soon from Forgotten Tomb Press. Forgotten Tomb Press has revealed the titles of its latest (and possibly last) additions to the table of contents for MISERIA’S CHORALE. Meghan Arcuri, who wrote “Inevitable” in CHIRAL MAD, is contributing the short story “Choosing my Confession”. Jon Ingold’s “Cracks”, which previously appeared in BLACK STATIC #28, will also be gracing the anthology. “Cracks” will make you think twice about those chigger bites on your arms. Ingold has also written a number of plays, short stories, and novels, such as FLAWS and JAZZ IN 3/4 TIME. The latest (and possibly final) new authors are Meghan Arcuri, who contributed “Inevitable” to CHIRAL MAD, and Jon Ingold, a British author of interactive fiction and co-founder of inkle, a company that makes interactive stories. To be published next month by Forgotten Tomb Press, MISERIA’S CHORALE will feature authors from the United States, Canada, Brazil, Great Britain, Italy, South Africa, the Philippines, and Australia. TRUE DARK, now available from Red Skies Press. Just in time for Halloween, Red Skies Press has released the anthology TRUE DARK, featuring my short story, “Bleed Through”. Before I started writing in earnest, I worked in radio for 15 years in Illinois and Wisconsin, both on the air and in the producers’ booth. It was (mostly) a lot of fun, but I had a strange fear I mostly kept buried during my time in the biz. And it was always, always worse whenever I stepped into the studio. “Bleed Through” is my way of working through my peculiar industry fear. “Magnum Opus” by John Taylor Jr. Journey into nightmarish landscapes, into the blackest midnight of your fear–into TRUE DARK, 17 tales guaranteed to make you sleep with the light on. You are currently browsing the exlibrislarsen blog archives for October, 2013.